The shear strength for mild steel is approximately 70 percent of its ultimate tensile strength, aluminum is about 50 percent and stainless steel is about 90 percent. Shear strengths also can vary significantly within the same material type. For example, the shear strengths for copper alloys have been reported to be between 50 and 90 percent of their ultimate tensile strength, depending on the alloy. For those that tried to use the formula from my August column—only to find yourselves thoroughly frustrated—I apologize for the error. I received several e-mails from readers who were not having problems with punch-tip breakage, but instead were experiencing punch-head breakage. To solve punch-head breakage problems, we must first understand why punch heads break. There are two main causes for head breakage: high impact force and high snapthrough forces. Impact failure results from excessive loading, which literally crushes the head. This type of failure usually occurs when the cutting clearance is tight and/or the part material is hard or thick. Conversely, snapthrough failures occur when there is a sudden unloading of pressure on the punch. This phenomenon is associated with increased punch-to-die clearance and with high-strength materials. Other factors that contribute to head breakage are punch pumping, due to poor fitup of the punch body to the punch holder, and high-hardness backing plates. will minimize compressive loading and flex at the unsupported outside diameter of the head at initial punch impact. Applying a shear angle to the punch point will help reduce the forces on the punch body and the punch head. Reducing the hardness of the backing plate is another viable solution. The backing plate must adsorb the punch impact adequately without cracking, breaking, permanently deforming or severely deflecting. Softer and tougher tool steels such as S-7 are good candidates for backing plates. When all else fails, using a punch with a larger body usually will reduce head breakage. • Make the body of the punch a slight press fit into the hole in the retainer. A press fit between 0.0003 to 0.0005 in. should be sufficient. • Ensure that the retainer is cleared for the radius connecting the head to the shank. Provide just enough clearance for the radius. Avoid excessive clearance. 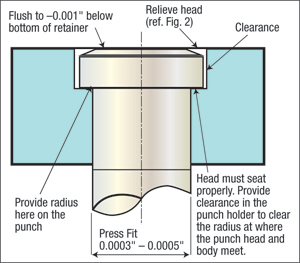 • Ensure the head of the punch does not protrude past the bottom surface of the retainer. 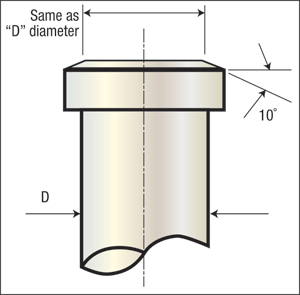 • Fit the punch so that the bottom of the head is as close as possible to the bottom surface of the retainer, but no more than 0.001 in. below.